This might be another Cydia mod you can add to your favorites list: AndroidLoader. This mod adds a slider to the home screen, allowing users to slide up in order to load apps, similar to Android’s default launcher. 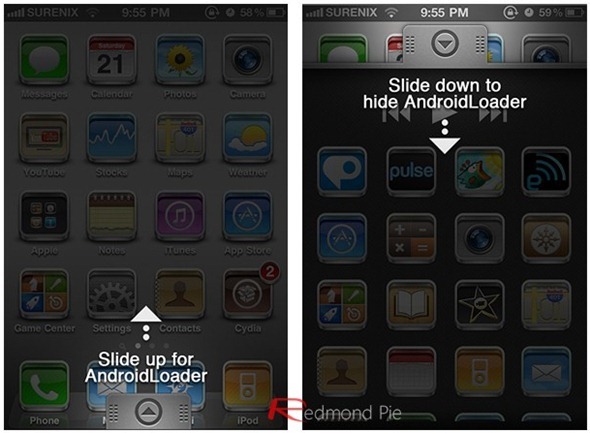 AndroidLoader was developed by Surenix, who authored SBSettings themes such as iDisplay and iRetina, is now venturing into what appears to be a full-blown mod. This app, which will soon be available on Cydia. 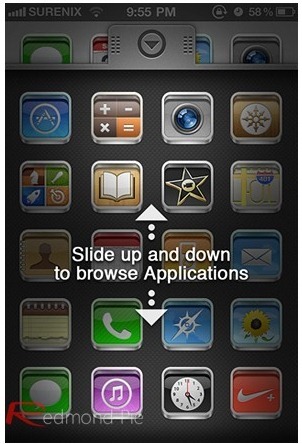 The application loader will essentially work like a big folder: slide up to see the apps, slide it down to dismiss them. There are also basic audio controls. We wish we didn’t have to slide the panel all the way up just to get to the controls, it might just cause too much screen clutter, but that’s almost a non-issue. Effort has clearly been put into this mod: it looks polished and scrolling works just the way you’d expect it to. That said, there’s absolutely no way to search through your apps: it’s just a scrollable list, which can be a problem if you have a lot of apps installed. There’s also no clear way to sort the apps by folders inside the panel, which can upset a few users who rely on this feature. This is a nice mod, no doubt about it, but I fail to see its practical application. iOS already offers multiple home screens by default, which are easier to scroll through than a continuous list that can have hundreds of apps, and more importantly, users are already able to access everything on their phone effortlessly with Spotlight. For $2.99, I don’t think AndroidLoader will be worth getting for most people. That said, if you’re a die-hard fan of Android’s application slider, you sure won’t mind spending that money once this app comes out on Cydia any moment now. No iPad support is available at this point. This mod requires you to jailbreak your phone first, since, just like any OS modifications, it’s not approved by Apple. It’s recommended that you have basic skills on how to restore your device, in case something goes wrong. You can follow our step by step guide to jailbreak your iPhone, iPad or iPod touch on iOS 4.3.1 with Redsn0w, PwnageTool 4.3 (untethered | tethered) on Mac, or with Sn0wbreeze on Windows, or on iOS 4.3.2 with Redsn0w, PwnageTool 4.3 (tethered), or with Sn0wbreeze on Windows, or on iOS 4.3.3 using Redsn0w, PwnageTool and Sn0wbreeze.